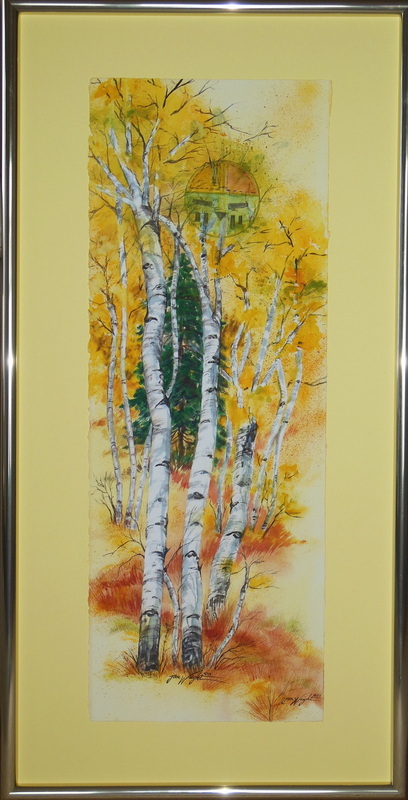 Southwest watercolor artist Jan Wright has exhibited at Artisans of Mancos since arriving to the area in 2008. She also exhibited her watercolors at Mesa Verde’s Far View Lodge for the six years, and was at Sendero Gallery in Durango for five years. 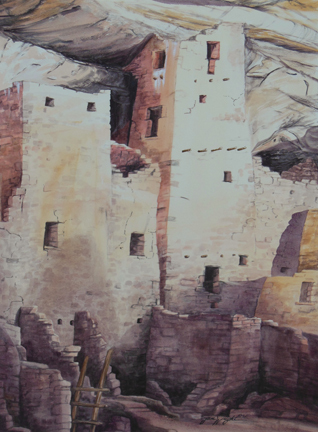 Jan has had over twenty-five one-woman watercolor exhibits in Utah, New Mexico, Texas, and Colorado. Her paintings are in numerous private collections as well as the Salt Lake County Fine Arts Collection, Wells Fargo Bank of St. George, UT, and the CEU Museum in Price, UT, Petrified Forest National Park, and Mesa Verde National Park. She was Artist in Residence at Mesa Verde National Park in October, 2012, as well as at Petrified Forest National Park in August of 2012, providing her an in depth painting and exploring experience in both parks. She then coordinated the Mesa Verde Artist in Residence program for three years. Ms.Wright specializes in desert, archaeological, and canyon landscapes of the southwest. Often an animal, bird, or native being is hidden within the colors,textures, and reflections of a painting. Her watercolors tend to be more vibrant and intense in color and detail, different from the often looser, splashy approach to watercolor. Jan teaches watercolor classes in her unique earthen roof home and studio through the Mancos School of the West. See www.schoolofthewest.org for her schedule as well as other local artists' offerings of classes. See more of her artwork at www.JanWrightWatercolors.com. Painting has been a part of my life since I was a teenager, with rural landscapes being my dominant theme. inspirational component of all of my paintings. The Southwest landscape offers me endless opportunities and continues to inspire me on a daily basis. think that fits me fine. Hilary Mockewich is a fine arts painter educated at Scuola Lorenzo de Medici in Florence Italy, and Pennsylvania Academy of Fine Art in Philadelphia. He painted and conserved murals and decorative paintings from 2002-2018 in Philadelphia. His most recent works include plein air landscape paintings with custom frames of the Four Corners region. In addition to plein air painting, Hilary does commission work for portraits, pet portrait, venetian plaster, gilding, decorative painting, and picture frame building. He currently resides in Shiprock, NM.